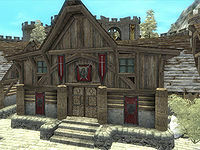 Bruma Fighters Guild is in the northern part of the city, between the Mages Guild Hall and Honmund's house. 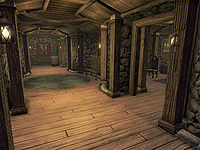 The building is divided into the Bruma Fighters Guild and the Fighters Guild Basement. The front door to the Fighters Guild reveals a large entrance room. Next to the front door is a door to the Basement. Bumph gra-Gash, Right-Wind, and a Fighters Guild Porter may be found here. On a bookshelf to the right sits two bottles of mead. The chest next to the pillar holds clutter. In the southwest is a sparring area, with four iron bows on the weapons rack on the west wall, and five iron arrows on the table next to the rack. On a table in the opposite corner sits a leather helmet, three iron longswords, one iron mace, a pair of leather gauntlets and a leather cuirass. 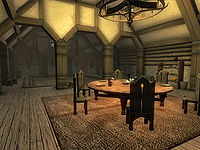 In the northwest is a dining area, with a large round table that seats six in the middle. On the table is only a bottle of cheap wine, a bottle of Tamika's West Weald Wine and an advert for Olav's Tap and Tack. Two barrels stacked in the northeast corner hold clutter and/or a repair hammer, and the barrel beside them contains food. The chest of drawers beside the barrels contains clutter, and two bottles of mead sit on top. The cupboard on the other side of the barrels contains beef, carrots, bread, a cheese wedge. The display case on the north wall is locked with a hard lock, and contains replica items as well as a flawed sapphire and topaz, and a flawless diamond. The two barrels on the west wall contain food. The bookshelf next to it holds two loaves of bread, a pumpkin, two potatoes, two tomatoes, a head of lettuce, and a cheese wedge. On top of the shelves sits another bottle of Tamika's and one of cheap wine. The chest next to the bookshelf holds clutter. All of the containers here respawn. The stairs next to the sparring area lead up to a small balcony. Two crates here contain clutter and/or a repair hammer, and both respawn. The door here reveals a room with a single bed in the northeast corner. A chest at the foot of the bed contains clutter, as does the chest next to the head of the bed. The cupboard in the southwest corner contains clothing, and the bookshelf next to it holds a steel dagger. The desk in the middle of the room may contain clutter and/or books, and on top sits a silver shortsword, a cheese wedge and two handbills: one from Wildeye Stables and one from Hammer and Axe. A steel battle axe is propped in the northwest corner. At the foot of the stairs down into the basement, an open barrel sits at the end of the hallway. The first door on the left reveals a large storage room. Two stacked crates in the northeast corner contain clutter and/or a repair hammer, as do two more crates stacked in the northwest corner as well as another two crates and a barrel in the southwest corner. The cupboard on the north wall contains clothing, and the three sacks on the floor next to the cupboard hold only clutter. Two chests side-by-side on the west wall hold more clutter, as does the sack next to them. On top of the crates in the southwest corner sit iron arrows and a set of fur greaves. The cupboard on the west south wall contains clothing, and an iron helmet sits on top. Three iron shortswords rest on the weapons rack next to the cupboard. The sacks in this room do not respawn; however, every other container here does. In the middle of the hallway is a chest of drawers with clothing and an iron war axe on top. The second room on the left reveals a large bedroom with two single beds on the west wall. The chests at the foot of each contain clutter. The cupboard on the north wall contains clothing, a bottle of mead sits on top, and four additional bottles and a rare pair of black wide pants are scattered on the floor between the cupboard and bed. The desk contains a book and/or clutter. All of the containers in this room respawn. The room on the right is another large bedroom with two single beds on the south wall. The chests at the foot of each contain clutter. On the bookshelf between them sit two loaves of bread, a cheese wedge, a repair hammer, and leather boots. A leather shield rests against it. The desk in the northeast corner contains clutter and/or a book. The table next to the door holds a bottle of mead, two tomatoes, and an iron dagger.